The strawberry is a beautifully sweet, aromatic, fiber-rich fruit packed with vitamins and antioxidants. There are 103 distinct species and subspecies of strawberry plants. The peak season for strawberries is typically April through June, but generally speaking, you can get strawberries year round. You can also purchase them frozen. Strawberries are a voluminous fruit, containing few calories and carbohydrate in a large portion. 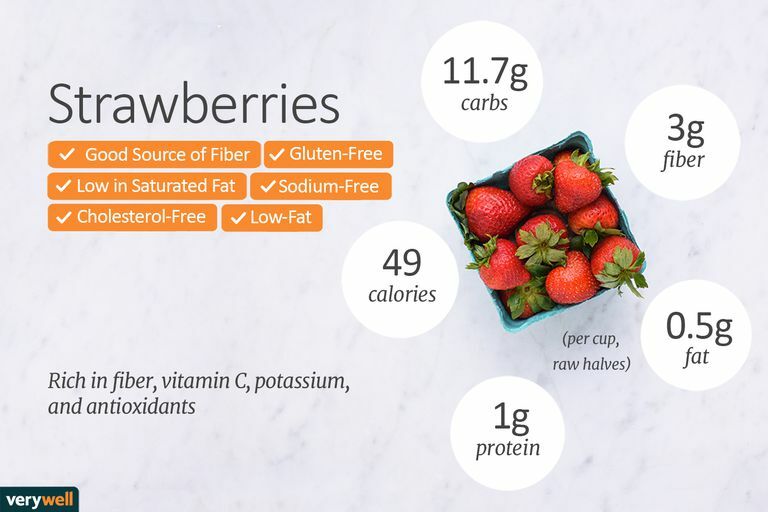 One cup of strawberries contains only 49 calories and provides 3 grams of fiber and only 12 grams of carbohydrate, resulting in 9 grams of net carbs. Strawberries have more insoluble fiber than soluble fiber. Strawberries have a low glycemic index of 40. The glycemic index of a food is an indication of how much and how fast a food raises your blood sugar. They also have a low glycemic load of 1.5, which takes into account the serving size. These indicators show strawberries should have little effect on your blood glucose or insulin response. Strawberries are extremely low in fat at less than half a gram in a cup of berries. Most of the fat is polyunsaturated, with a smaller percentage of monounsaturated and very little saturated. A cup of strawberries also provides 99 milligrams of omega-3 fatty acids and 137 milligrams of omega-6 fatty acids. Like most fruits, strawberries are low in protein, with only 1 gram per cup. If you want to balance protein with carbs when eating strawberries, you can eat them with yogurt or other foods that provide protein. A cup of strawberries provides more than a day's worth of vitamin C and 9 percent of the daily value of folate. Folic acid is essential in fetal development and helps to produce and maintain new cells. Other vitamins are present in values below 5 percent. As for minerals, strawberries are a significant source of manganese, with 29 percent of the daily value in a cup, and 7 percent of your daily needs for potassium. Strawberries have lesser amounts of iron, calcium, copper, and phosphorus. Strawberries are rich in fiber, vitamin C, potassium, and antioxidants such as anthocyanins and quercetin. Adequate amounts of insoluble fiber can help maintain bowel health. A diet rich in potassium can aid in preventing high blood pressure and ischemic heart disease. Quercetin, a flavonoid found in strawberries, may have effects in reducing inflammation, blood pressure, and other risk factors for cardiovascular conditions. Anthocyanins are plant pigments that provide the red color in strawberries. They have antioxidant and anti-inflammatory properties that may prove to be important for health. The health benefits may come from eating fruits and vegetables them in their natural form rather than trying to isolate various compounds as supplements. According to the U.S. Dietary Guidelines for Americans, most people should be doubling their fruit and vegetable consumption to reduce their risk of chronic disease and maintain a healthy weight. Do I need to purchase organic strawberries? Strawberries have a thin skin makes them vulnerable to pesticide residue, ranking them one of the highest fruits for pesticide residue. Therefore, if possible, it's probably best to purchase organic. If cost is an issue, aim to purchase strawberries locally when they are in season and freeze them for use throughout the year. Otherwise, consider buying organic frozen berries. If you buy conventional strawberries, rinse them thoroughly before consumption. Can I eat the seeds on a strawberry? The black seeds on the strawberry are edible and perfectly safe to eat. They are the source of the beneficial insoluble fiber in strawberries. Choose strawberries that smell sweet and are a rich, vibrant, red color. Avoid berries that are mushy or have begun to get moldy. Strawberries spoil quickly, so you'll want to use your berries immediately or freeze them. Strawberries can be used to sweeten yogurt, cottage cheese, and hot or cold cereals. They can be blended into smoothies, chopped and placed in salads, side dishes, or salsa. Their sweet taste and plump texture make a great addition to healthy dessert choices. Strawberries are also delicious dippers—dip them into nut butter or dark chocolate for a sweet tasting, fiber-rich snack or dessert. Strawberry-Topped Chicken Salad: Enjoy this for a light meal on a hot summer night. Strawberry and Turkey Balsamic Salad: Strawberries shine when paired with balsamic vinegar. Dairy-Free Strawberry-Banana Smoothie: Fresh or frozen bananas make a wonderful smoothie base. Strawberry Basil Sparkler: Brighten sparkling water with basil leaves and strawberries for a sugar-free quencher. Strawberry Pistachio Pavlova: This meringue topped with whipped cream and strawberries makes a lovely dessert. Strawberry food allergies are rare. However, if you have hay fever you may have a pollen-allergy food syndrome and cross-react to proteins in strawberries that are similar to the pollen. If you are allergic to birch, you experience this reaction when you eat strawberries. You might feel a tingling or itch in your mouth after eating strawberries. In rare cases, this can be more serious and trigger throat swelling or anaphylaxis. You may also experience a strawberry allergy if you are allergic to related fruits in the Rosaceae family, including pears, peaches, cherries, apples, and raspberries. Afrin S, Gasparrini M, Forbes-Hernandez TY, et al. Promising Health Benefits of the Strawberry: A Focus on Clinical Studies. Journal of Agricultural and Food Chemistry. 2016;64(22):4435-4449. doi:10.1021/acs.jafc.6b00857. Food Allergy. Mayo Clinic. https://www.mayoclinic.org/diseases-conditions/food-allergy/symptoms-causes/syc-20355095. USDA National Nutrient Database for Standard Reference, Release 28. USDA. https://ndb.nal.usda.gov/ndb/.